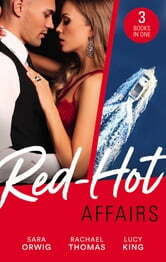 Isabelle Smith isn’t surprised that her new boss, Texas tycoon Tony Ryder, doesn’t remember her — their night of passion was so long ago. She vows to stay only as long as he never uncovers the truth. But then he does. The man who always gets his way makes her an offer she can’t refuse. Still, Isabelle won’t mix business and pleasure without a wedding ring — and Tony isn’t a marrying man. Which means they’re in for the most passionate negotiation of their lives! Captivating king of the racing circuit Sandro Roselli might send Charlotte Warrington’s pulse into overdrive, but he’s hiding something about her brother’s death. Sandro has offered her a job, and Charlotte will make sure she’s in the driver’s seat to uncover his secret. Yet life in the fast lane with Sandro is dangerous. The irresistible Italian is driving her senses crazy — but can they survive the dark truth he hides? After finding her boyfriend in bed with another woman, Laura decides it’s time to take charge of her life. However, the last thing she expects is to end up having wild, naked fun with the gorgeous guy next door!